Narrator: Only two humans survived. A man and a woman are reclining on the ground, with upper bodies slightly raised and supported by both hands on the ground. Woman: We ought to repopulate the planet. But then our children would have to be incestuous. Man: ...crime, betrayal, nuclear war. Woman: But there are pros. Music, science, technology, art, love, movies, TV, sports. Man: Looks pretty even to me. I don’t know which way to go. Both are now in a slightly more upright position, still seated on the ground. Man: Wait! We forgot webcomics! Woman: So we did! That changes the equation completely! 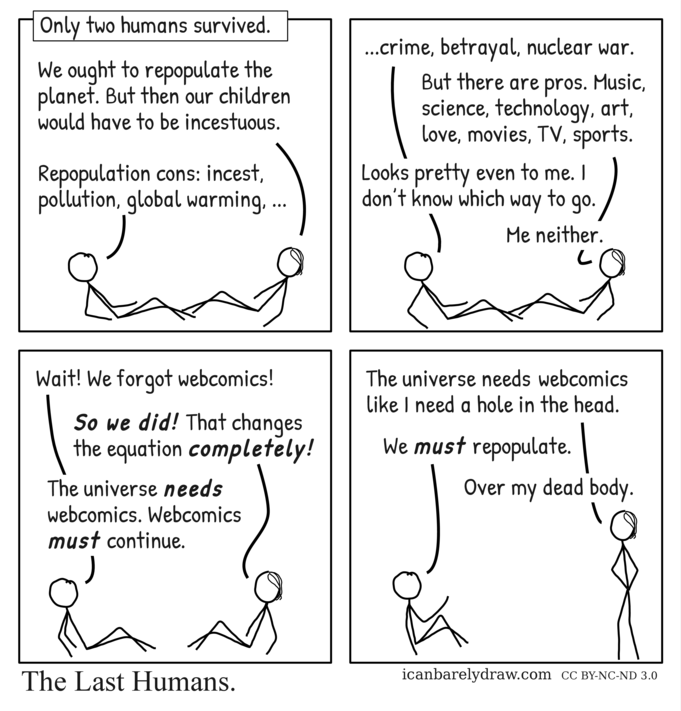 Man: The universe needs webcomics. Webcomics must continue. Woman: The universe needs webcomics like I need a hole in the head. The man rises to an upright seated position and gestures with one arm. The woman stands in a defiant pose with both hands on her hips. Woman: Over my dead body.